Thanks to my friend Richard Nobbe for bringing this video to my attention. It’s a bit dated in many aspects but the information is very good, and I geek out on just about anything that has to do with symbolism. This is a cool video from the Messages of Christ YouTube channel where the garments of the high priest are explored in their connection to Jesus Christ. This guy made this whole thing from scratch which is pretty cool. Catholics are heavily immersed in ritual, so I think they “get” ritual more than most, or are at least more accustomed to it. Latter-day Saint Sabbath services and surroundings at church are nowhere near as elaborate as the richly meaningful proceedings conducted in ornate cathedrals. Maybe we wish that church and the temple were equally as rich in symbolism and ritual, it’s a captivating thought, but I kind of like it the way it is. If we were around the temple all the time, would we appreciate the contrast? How wonderful it is to go to the temple and experience stepping out of one world and into another (which is intentional). Home after a long journey is never the same, but it hasn’t changed, you just see it with different eyes. A temple is a model of the cosmos; the cosmos above which holds all of creation, and the cosmos below which is man. That which is common is profane, but contrast parts light from darkness, revealing everything in between. Worlds without end for us to explore, and we think this only refers to orbiting planets. The endowed are veiled with a garment, a reminder of where the true temple is. How many dwell perpetually in the outer courtyards of consciousness, never setting foot inside the Holy of Holies within. A fun idea about how adults, youth, and kids can learn about symbolism and temples with a sketchbook and LDS Symbol Cards. This quote brilliantly sums up a critically important key to understanding symbols. A few weeks ago, I was trying to leave my wife a love note on the fridge with some of the magnetic letters that were scattered everywhere. I quickly realized how limited my ability to express myself would be as I only had one of each letter. Although I did manage to put some kind of crude message together, imagine trying to write a novel or something! Letters of the alphabet are symbols, and while the letters of the English alphabet don’t have meanings in and of themselves like Hebrew letters do, their real ability to communicate shines when they are combined with other letters to make words and sentences. As you can see by the photo below, having only 26 letters to work with severely limits one’s capacity to communicate. If we think of symbols like letters of the alphabet that form words and sentences, then we are expanding our capacity to be taught by the Spirit. One of the things that worried me about creating my Symbol Cards and ldsSymbols.com was inadvertantly establishing some kind of authoritative guide that led people to exclude any meanings that didn’t appear in my resources. I didn’t want people to think that the meanings I shared were the only meanings or that some meanings were “better” or “more correct” than others. I felt like the projects were worthwhile as long as people understood that they represented a starting point, a place to document certain potential meanings that appear to be consistently used in scripture, culture, mathematics, biology, astronomy, etc. I think I need to do a better job at expressing that because it cannot be stated enough. 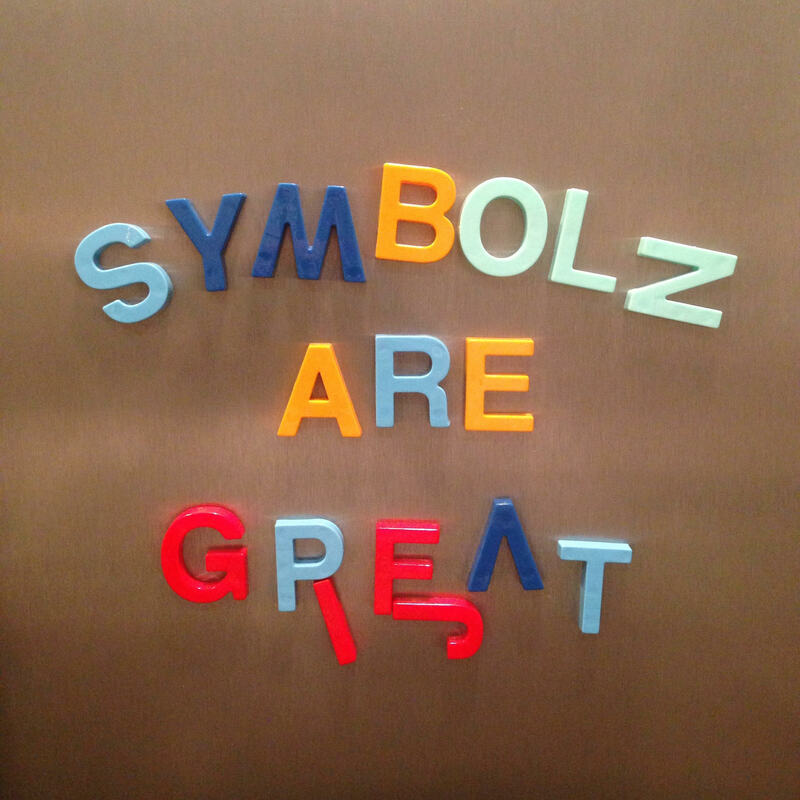 Has symbolism been a tough subject for you to understand? Does McConkie’s quote resonate with your experience or help you see things in a new light? What other qualities about symbolism do you feel are important to take note of? Picture in your mind’s eye a beautiful stained glass window where light from the sun passes through a collection of colored panes that transform the light into something wonderful. Church is like the window and we are like those colored panes. 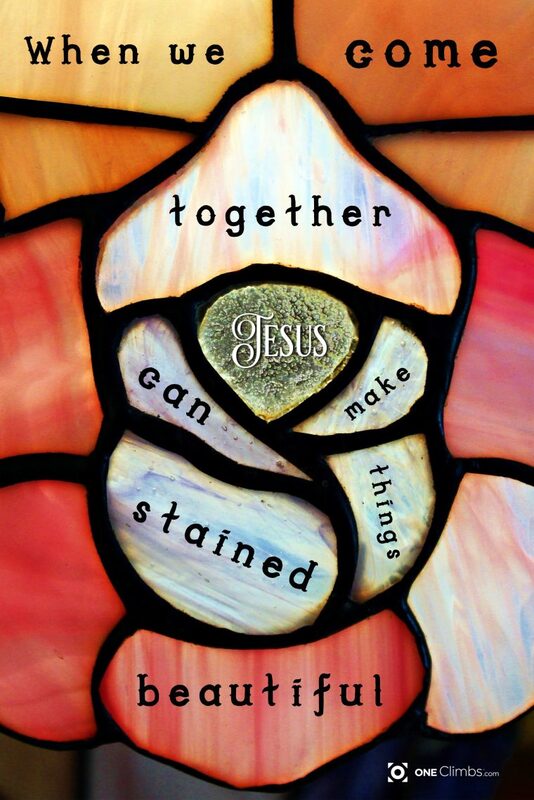 When we come together, the light of Christ shines through the window we create out of everyone’s collective “stained glass,” beautiful only to those have eyes to see. A recent post on Junior Ganymede mentions the ritual bath called a mikveh where Jews practiced ritual immersions in pools of water. The parallels to Christian baptism (which means to dip or immerse) are many. In both rituals the purpose of the immersion is a symbolic cleansing or refreshing. Anciently, immersion in a mikveh was required for those converting to Judaism. to immerse newly acquired utensils used in serving and eating food. The Eye of God or Man? I was looking at this picture of the Salt Lake Temple the other day and had a thought. 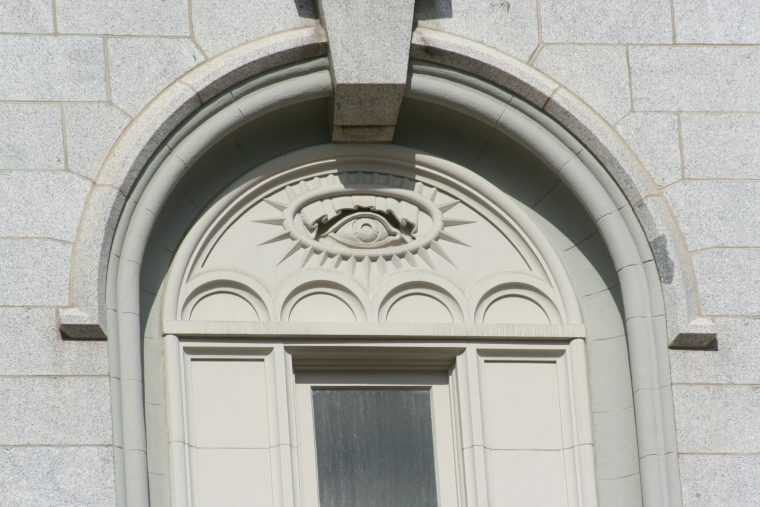 Typically, the “all-seeing eye” of God is depicted within a triangle and not an oval. This version also has a veil-like curtain that looks like it is being removed from the eye. That’s when I wondered if this is isn’t depicting God’s eye at all, but man’s. God would not need to have a veil removed from his eyes. Does he even perceive us through a veil or it is just that our vision is obscured by one? I think it’s the latter of the two. I think this symbol is depicting an experience that the temple has been constructed to facilitate. There’s the matter of these 28 sun-like rays emanating from the oval that I’d like to address next. I have not yet seen the film The Tree of Life although the title alone draws my interest. This particular sequence depicts the creation in a manner that is very similar to the creation sequence in the presentation of the LDS temple endowment. In both instances, we see the earth being organized and life appearing. In this Hollywood version, we see the process of evolution being depicted and I realize that some people might have a problem with that. Personally, I do not have any problems with evolution being part of the creation process (that’s a whole other subject) but if you do, I invite you to focus on the symbolism, the principles and overall beauty of the story being told here and the surprising little gem towards the end. At 12 minutes in you have this really powerful and thought-provoking scene that seems to be symbolically depicting the first act of grace or mercy where one dinosaur decides to not kill another one that is evidently injured or dying. What makes the scene striking is how such a thing does not fit within the law of the jungle. In a creative twist, showing an act of mercy coming from a dinosaur rather than a human is making a bold statement. It is unexpected and makes the principle stand out even more. It is a moment where compassion, this sense of caring and love enters the scene of creation for the first time. Like the temple video, I think we can pause on being literalistic and appreciate the principles being symbolically illustrated. Indeed, if we are to be instructed by symbolic teaching at all, we must suspend literalism and learn to view things from many facets. All in all, I absolutely love this entire sequence and was quite amazed to find something of this nature coming out of Hollywood. Profane: late 14c., from L. profanare “to desecrate,” from profanus “unholy, not consecrated,” from pro fano “not admitted into the temple (with the initiates),” lit. “out in front of the temple,” from pro- “before” (see pro-) + fano, ablative of fanum “temple” (see feast). Related: Profaned; profaning. The adjective is attested from late 15c. ; originally “un-ecclesiastical, secular;” sense of “unholy, polluted” is recorded from c.1500. Qadash: a primitive root; to be (causatively, make, pronounce or observe as) clean (ceremonially or morally):–appoint, bid, consecrate, dedicate, defile, hallow, (be, keep) holy(-er, place), keep, prepare, proclaim, purify, sanctify(-ied one, self), X wholly. For some other interesting insight on the word consecration, this article from TempleStudy.com is enlightening. I’m not aware of any other documents quite like this one. Here we have a general authority, David O. McKay, explaining temple ceremonies and covenants to a group of missionaries just before they receive them. I’ve had this in my personal collection for a few years now, I got it from a public pdf hosted on the BYU Idaho website. I think this would be a great thing to study for anyone preparing to enter the temple, and an insightful read for anyone who has already experienced temple worship. Such was the commission given by the Savior to His Apostles just prior to the Savior’s return to heaven, following His resurrection. 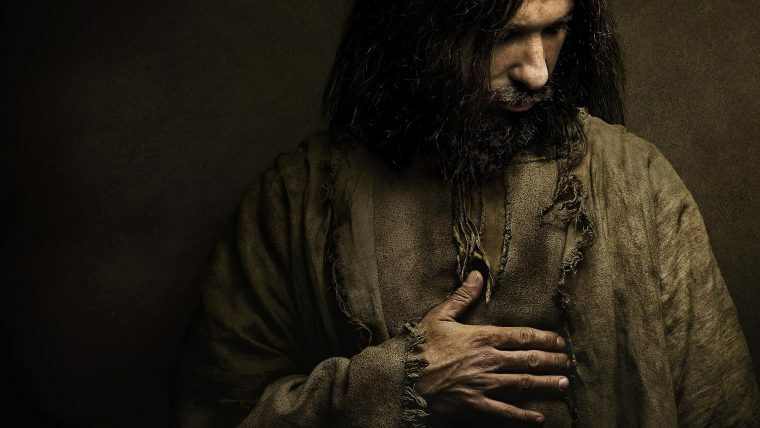 Such is the admonition and authority He has given you, my fellow workers, and I congratulate you this morning upon this calling and upon your acceptance of the privilege to preach the Gospel. It is not only a privilege but a great responsibility to be commissioned as a missionary in the Church of Jesus Christ of Latter-day Saints. In that commission the word “teach” is used and repeated. You are teachers. Very young men and young women to go out and show the world the philosophy of life, to teach them the proper way of living, but that is your calling. I congratulate you on being worthy to go through the House of the Lord. Your presence here indicates that you have lived a pure life, each of you, that you are worthy to go into the presence of the Father. Are you? This quote goes great with this article – think about it. In a recently published book “Sacred Walls: Learning from Temple Symbols” by Gerald E. Hansen and Val Brinkerhoff (photographer), readers are presented with a series of doctrinal themes that are explained using the particular architectural symbolism of various temples. Both books and buildings have voices. But rather than the letters of an alphabet, buildings use towers and spires, columns and buttresses, mosaics and paintings, glass and geometric figures, and statues and friezes to speak volumes. However, even though architectural symbolism existed before the written word, the message of a building is often difficult for most of us to recognize. 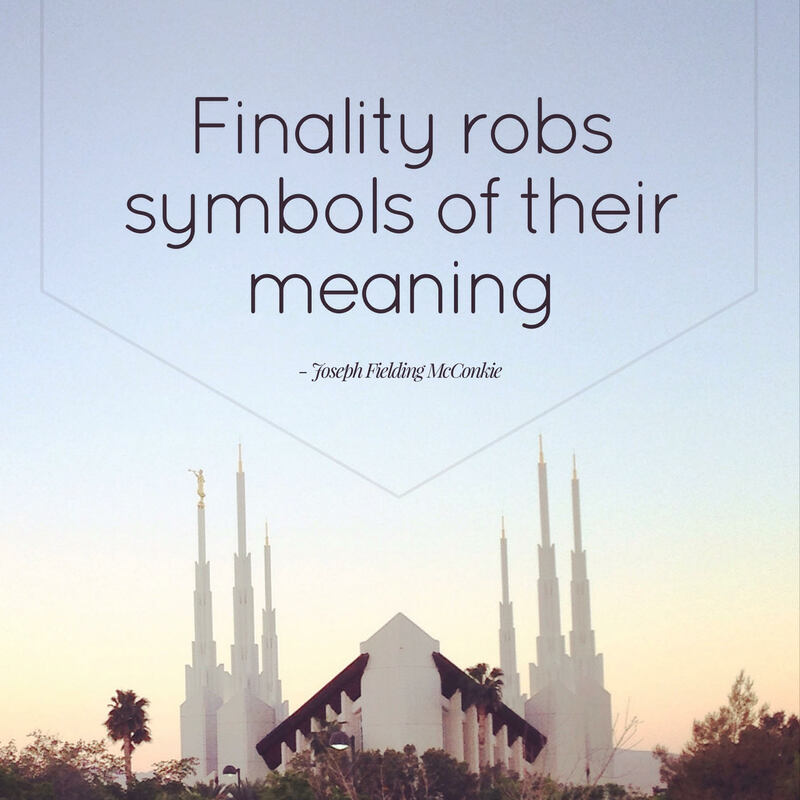 For Latter-day Saints, temples are the most important and symbolic buildings in existence. Through temples the unique doctrines of the restored gospel are communicated. Although the bulk of this instruction occurs inside the temples, temple exteriors also tell of these profound doctrines — when you understand how to read them. President David O. McKay once said that he was “disappointed” when he first went through the Temple and he explains why. I think this could be helpful to any who are preparing for the temple, or who are still trying to understand what it is all about. I appreciated these words from President McKay. I think we all spend most of our first trips to the temple focusing on the mechanics if we were not adequately instructed on learning through symbolic teaching. While the initiatory has many parallels to baptism and confirmation, there’s nothing comparable to the endowment anywhere else in Latter-day Saint worship. I think the closest you can get are the accounts recorded in scripture where a prophet is taken up into the presence of the Lord, guided by angels and shown the creation of the world and given sacred knowledge. At one level, I believe the endowment is a symbolic “ascension vision”, similar to the experiences of Abraham, Moses, Enoch, Nephi, and the Brother of Jared to name a few. 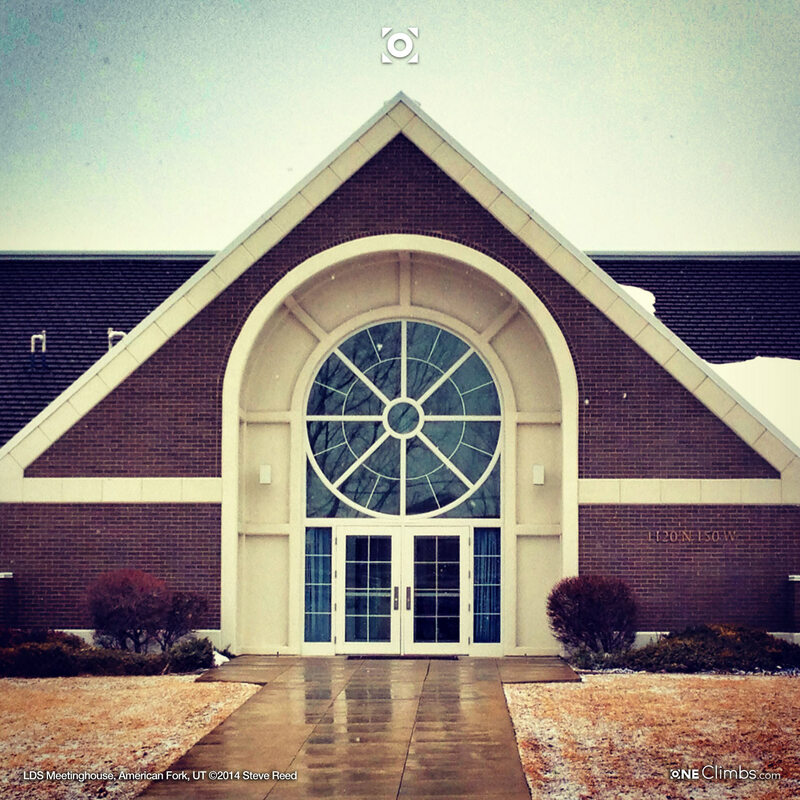 I was up in Utah for a wedding and while driving around American Fork I stopped my car when I saw this LDS meetinghouse. I was immediately reminded of a chapel here in Nevada that I really like. Just like the Nevada meetinghouse, the American Fort meetinghouse emphasizes the number 8 with a giant round window divided into 8 segments.